This is as far as the tour will take you at the moment, I am limiting myself to the area inside the city walls (apart from St. Dunstans on the north west). Actually here we've stepped outside that area a little. The white building on the right is the Heraldry Centre, home of the Institute of Heraldic and Genealogical studies and also of Achievements Ltd, the country's premier and oldest established company for family history research. The banner will take you to their website. 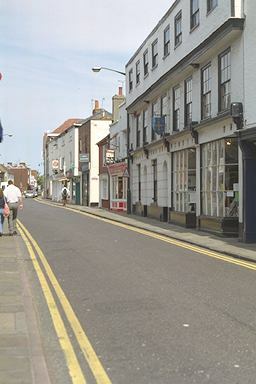 Ahead, the road leads out of the city towards the Isle of Thanet.